A decade and a half after NOT BRAND ECCH ended, Marvel Comics took another shot at self-parody with WHAT THE--?!. 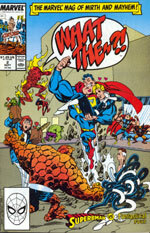 Originally launched as a four issue limited series, the Marvel bigwigs eventually deemed it successful enough to run an additional twenty-two editions. The original plan was to divvy up the first four between two editors, Carl Potts and Jim Salicrup. As I've mentioned several times elsewhere on this site, Jim and I have had a very good working relationship over the years, and upon hearing the news of WHAT THE--?! 's impending assemblage, I pretty much took it as a fait accompli that I'd be able to weasel my way into Senor Salicrup's pair of parody publications. And I wasn't wrong--happily, I made it into both of his issues! Luckily, there was no question about my being included in Carl Potts' plans, since, hey, HE was the one who alerted me to the project's existence in the first place! The good news came, you see, when he called attempting to enlist my, ahem, creative assistance!! 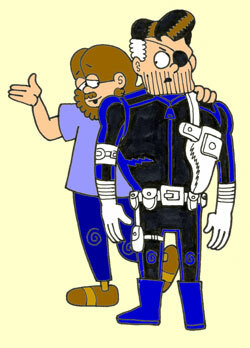 I'd met Carl on several previous occasions, mostly at mutually attended comics' conventions held in the early eighties. He seemed to be a nice enough guy, but quieter, less demonstrative than the average comics' professional. My most vivid memory of him remains the Ottawa show we were both guests at. Oh, not the show itself, the dinner afterward. Local hero Dave Sim had invited Lynn and I to join him for a bite, and the other invited dining partner--Chris Claremont, then at the height of his popularity with the X-men, albeit, post Byrne--brought along his Marvel buddy, the aforementioned Mr. Potts. As it turned out, Lynn and I, Carl and his lady friend--we all combined to form a massive third wheel during the repast. Dave and Chris talked and talked and talked some more!! THESE guys were more like your typical pros, lemme tell ya! As a majority of the discussion seemed based on the philosophical underpinnings found in the first, oh, thirty or so issues of Dave's groundbreaking CEREBUS THE AARDVARK title, there really wasn't a lot for the rest of us at the table to contribute, because it soon became painfully obvious--at least to ME--that no one else there had READ the dang book!! (Okay, I'd read the first half dozen, but not long afterwards I got lost amongst the interior monologs that were taking up entire issues. Over the years, I've had many fine folk recommend the series to me, but I've never quite been able to get back on that horse--or aardvark, if you will...) Dave had been very kind to me, and I was concerned that my non-participation in the discussion might be seen by him as some sort of slight. I needn't have worried. Squiggly elbows weren't on the agenda that eve! The two scribes were so enamored of each other that magic night that they planned an X-MEN/CEREBUS crossover, an idea that got as far as being reported on the front page of an edition of the COMICS BUYERS' GUIDE, but no further. Yup, Carl and I were present that night when comics history was ALMOST made, doing our best not to let on to our Canadian host and his new-found partner that we didn't have half a clue about most anything they were jabbering on about!! That was Carl--even in my best anecdote about him, he's downright low-key!! And then, years after the notion of the mutants meeting the mammal had long since faded away, here he was, calling to offer me work! When I proposed my idea to my newfound boss, initially he was a bit reticent to get on board. After all, he couldn't pay me any extra money for this unsolicited artwork--there wasn't enough in the budget to cover the added expense, he explained. No problem, I assured him--I didn't WANT the additional cash. (Okay, sure, I would've TAKEN it had it been offered, but...) I just wanted the flexibility of SEEING what I was writing, and if I was the one who had to scribble up the scenes to make that happen, fine. So be it. Slowly he came around to my way of seeing things, but once he was convinced that this would vastly improve the yock-ratio of the still-unwritten story--AND that this wasn't some sleazy ploy to pad my pockets--he agreed to let me turn the tale in in layout form. Yeah, yeah, yeah--I know that, in the short run, I undersold myself, but in the long run, just look what I've got to show for it!! And you know what? To this day, I've yet to EVER write a story full script!?! Whew--dodged THAT bullet!! So I sat down and wrote "The Retirement of Knick Furey, Ex-Agent of S.H.E.E.L.D.!" (I don't recall for sure, but the retirement angle may well have been Carl's--the rest I'm certain--for better or worse--is all mine.) After considerable initial brainstorming, dialog scrawled with a Bic pen onto typewriter paper, and thumbnail layouts roughed out in pencil, I settled in at the kitchen table, opened my 11" by 14" Morilla 100 page sketch book, and armed with a red Flair Pentel, produced the final copy for submission. The whole red line thing is a bit of an affectation, I'll admit. For those of you who aren't aware, the color crimson reproduces black, perfect, as it turns out, for copies. This way, you see, I'd have TWO versions of my artwork--the red originals and the black copies!! I did this for many years--ALL my KIDZ layouts are in red, for instance--and still do it upon occasion, though these days, in an effort to crank material out for you, my panting public, the layout phase is oft-times skipped. But not back then, not back on October 19th, 1987. That date sound familiar to any of you? No? Well, amongst Wall Street wranglers, that particular day came to be known as "Black Tuesday". It was one of those bad, bad ones, y'see--a fact I was blissfully unaware of since, in order to better concentrate on the task at hand, I uncharacteristically had the radio turned off the entire afternoon. My first CD player was still several years in the future and I was still deep into my AM talk radio phase, but that day Soupy, Howard, and the ever-irascible Bob Grant were silenced by my need to pump out parody. Hey, I'm sorry a lotta folks lost their shirts, but at least I wasn't the ONLY one losing money that day!?! Although certainly I hoped Carl would be happy with what I turned in--and I have no memory of it being otherwise--I really don't recall exactly what I truthfully expected to be done to my layouts by the tale's assigned artist. Naively, I vaguely remember an assumption that my work would be torn apart and then totally reassembled by the far more experienced illustrator. Which would've been fine--how could I not defer to John Severin? When Carl sent along a set of pre-publication black and white copies of Mr. Severin's interpretation of my script, I was stunned! Stunned and elated!! The legendary cartoonist had barely changed a thing on any of the seven pages of my story, save the odd minor alteration here and there! Wow! Wow again! It was THEN that I had my Sally Field moment--"He liked it, he really liked it!?!" As the years passed, I became a bit more pragmatic--it was probably just EASIER to follow my all very explicit directions. But, I suppose I'll have to grant that he didn't HATE it, at least not enough to feel the need to completely overhaul it!! Fact is, I was honestly surprised how GOOD it looked!?! Geez, I never realized my stuff could look that snappy when it was in the hands of somebody who REALLY knew how to draw!?! As an editor, Herr Potts apparently knew his craft well, as this once-in-a-lifetime pairing of Hembeck and Severin unabashedly proved! !